The region’s newest community weekly run is seeking locals to help volunteer with the Ocean Grove parkrun. The 5km Ocean Grove parkrun commences at 8am on Saturdays and meets at the Barwon Estuary Picnic area along Peers Crescent, which is adjacent to the Riverview Family Caravan Park. The Ocean Grove parkrun course takes in the beautiful surrounds of the Barwon River with participants running two laps on a wide path with gravel and tarmac surfaces. 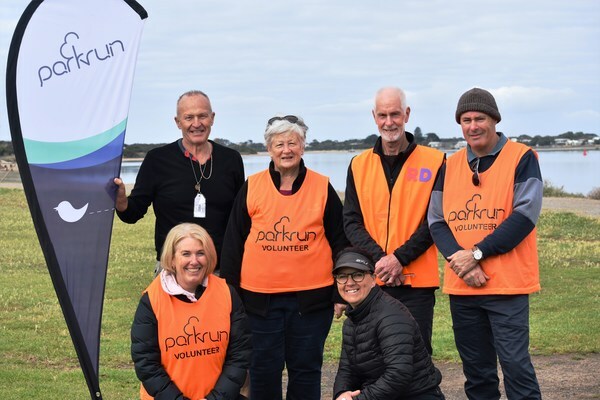 Ocean Grove parkrun celebrated its six-month anniversary in October and event co-director Graham Bignell said they were in need of more helpers for it to continue. “That is the bottom line if we don’t get the volunteers – we can’t run it,” Bignell said. The first Ocean Grove parkrun which launched in April this year attracted 247 participants. Each week on average there are up to 70 participants per week which take part with volunteers ranging from five to 11. “The minimum team is five (volunteers) and that is without marshals on the end,” he said. “Although it is better if something goes wrong you really need a marshal on the end of the course. “Seven volunteers is much better and also eight volunteers including a photographer. Bignell said the run was in need of more volunteers in December. OCEAN Grove parkrun will take a five-week hiatus from late December and all of January due to peak summer holiday period and congestion flow around the Riverview Family Caravan Park precinct. Bignell said the support of the Riverview Family Caravan Park helped when the Ocean Grove parkrun was launched. “They (Riverview) have been really helpful and we have talked to them,” he said. “There is a couple of crossovers from the caravan park to river – they have been supportive since the start. Ocean Grove’s final parkrun for 2018 is on 22 December before it resumes on 2 February in 2019. Organisers have encouraged participants to visit nearby parkruns in the region during this time. PARKRUN is worldwide with organised free weekly 5km timed runs taking place across Australia and around the globe. In wider Geelong, they are weekly parkruns held on Saturday mornings at Eastern Gardens and also at Balyang Sanctuary in Geelong, Portarlington and Torquay. For assistance in volunteering with the Ocean Grove parkrun email oceangroveoffice@parkrun.com for more information. To participate in Ocean Grove parkrun log onto www.parkrun/register to enter. The Ocean Grove parkrun is a weekly free 5km timed run for all ages.